It’s spring so naturally that means you’ll be baring a little more skin. 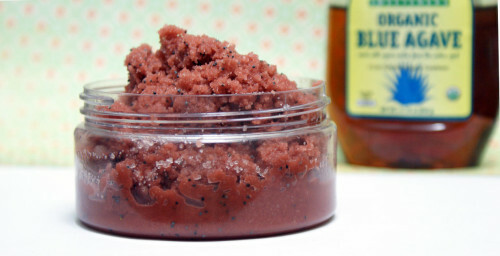 And what better way to keep your skin looking fabulous than with a freshly scented sugar scrub inspired by the season? 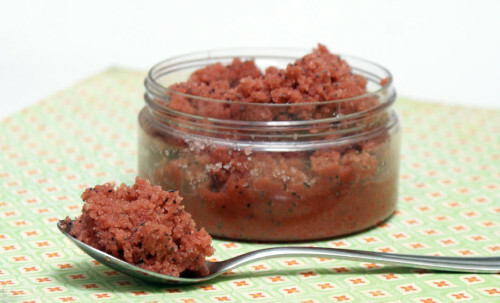 This homemade sugar scrub recipe is less greasy feeling than most other scrubs that are made from olive oil and it’s thick texture makes it easier to apply. It contains skin nourishing coconut oil, grapeseed oil and shea butter for moisture without the oiliness so it’s great even on those hot days that are right around the corner! Using a digital kitchen scale weigh out the shea butter into a medium glass pyrex measuring cup. Heat in the microwave until melted, then weigh out the coconut oil and stir into the melted shea butter. Stir until the coconut oil melts completely, then weigh out the sesame seed oil, grape seed oil and agave nectar and stir into the melted shea butter and coconut oil. Now weigh out and add the fragrance and mix. Using measuring spoons measure out the clays and poppy seeds into a separate container. (If you prefer your scrub not have color simply use all white kaolin clay.) Then weigh out the sugar and mix well with the clays and poppy seeds. Now combine the dry ingredients with the wet ingredients and mix until thoroughly blended. Scoop into an 8 oz. container of your choice. To use simply scoop out the desired amount and massage into skin in the shower, then rinse. Or keep it by the sink for use on hands. Like this recipe? 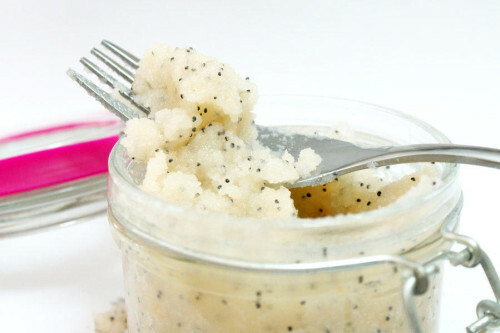 Then also be sure to check out my other homemade sugar scrub recipes including my DIY Creamy Lemon Poppy Seed Sugar Scrub, my Best Ever Natural Homemade Foot Scrub Recipe and DIY White Tea Solid Sugar Scrub Cubes! You’ll also discover even more natural homemade sugar scrub recipes as well as other bath, body and beauty DIY’s by following my DIY Bath & Body board on Pinterest. Oh I definitely want to try this out, I am a sucker for anything grapefruit! And I also read the other day that using a sugar scrub before stitching with silk thread helps keep your hands smooth, so I’ve been looking for a good recipe!